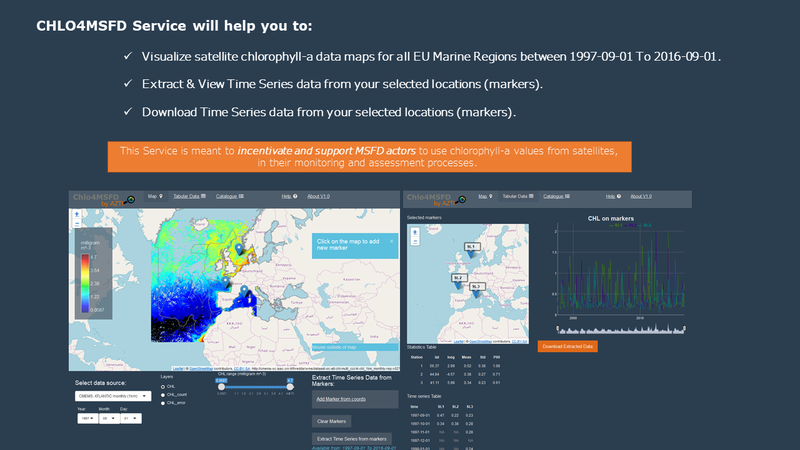 CHLO4MSFD is an operational web portal service focussed on providing user friendly tools to view, extract & download satellite-derived chlorophyll-a data to support the Marine Strategy Framework Directive (MSFD) in European Marine Regions. It is dedicated to stimulate and enhance the use of these data and derived products by MSFD actors in their monitoring, assessment and reporting activities. The data provided by CHLO4MSFD have been generated using E.U. Copernicus Marine Service Information, and the CHLO4MSFD web service is operationally maintained by AZTI. This service lays on historical datasets and is updated anytime these datasets are updated and available through Copernicus Marine Service catalogue. Updates may also be produced when new products eligible to be part of the CHLO4MSFD catalogue, are discovered or generated.